1. How much natural gas is the United States currently extracting? Answer: (d) The United States is a natural gas importer, and has been for many years. 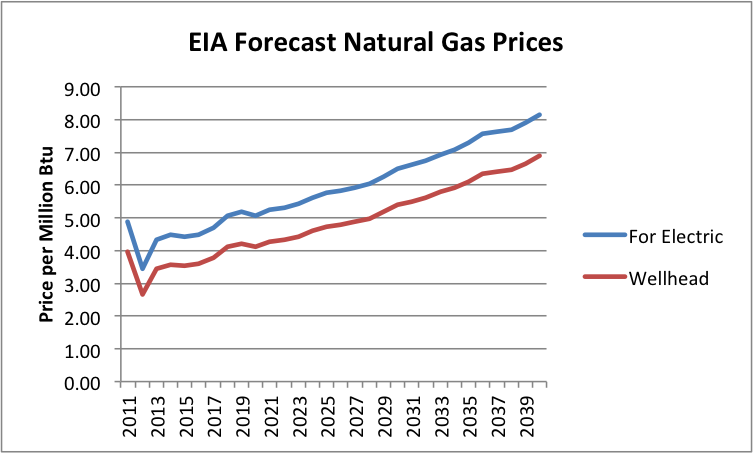 The EIA is forecasting that by 2017, we will finally be able to meet our own natural gas needs. In fact, this last year, with a cold winter, we have had a problem with excessively drawing down amounts in storage. Figure 2. US EIA’s chart showing natural gas in storage, compared to the five year average, from Weekly Natural Gas Storage Report. There is even discussion that at the low level in storage and current rates of production, it may not be possible to fully replace the natural gas in storage before next fall. 2. How much natural gas is the United States talking about exporting? (a) A tiny amount, less than 5% of what it is currently producing. (b) About 20% of what it is currently producing. (c) About 40% of what it is currently producing. (d) Over 60% of what it is currently producing. The correct answer is (d) Over 60% what it is currently producing. If we look at the applications for natural gas exports found on the Energy.Gov website, we find that applications for exports total 42 billion cubic feet a day, most of which has already been approved. * This compares to US 2013 natural gas production of 67 billion cubic feet a day. In fact, if companies applying for exports build the facilities in, say, 3 years, and little additional natural gas production is ramped up, we could be left with less than half of current natural gas production for our own use. *This is my calculation of the sum, equal to 38.51 billion cubic feet a day for Free Trade Association applications (and combined applications), and 3.25 for Non-Free Trade applications. 3. How much are the United States’ own natural gas needs projected to grow by 2030? If we believe the US Energy Information Administration, US natural gas needs are expected to grow by only 12% between 2013 and 2030 (answer (b)). By 2040, natural gas consumption is expected to be 23% higher than in 2013. This is a little surprising for several reasons. For one, we are talking about scaling back coal use for making electricity, and we use almost as much coal as natural gas. Natural gas is an alternative to coal for this purpose. Furthermore, the EIA expects US oil production to start dropping by 2020 (Figure 3, below), so logically we might want to use natural gas as a transportation fuel too. Figure 3. 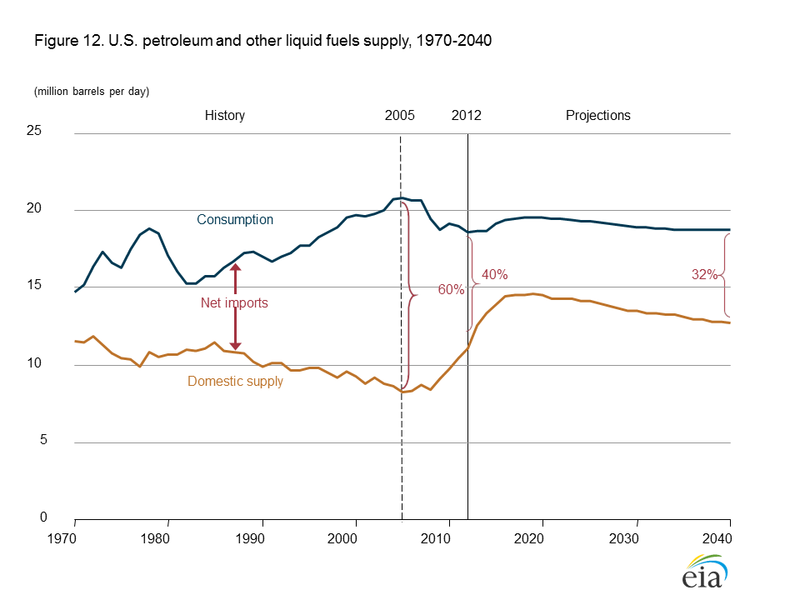 US Annual Energy Outlook 2014 Early Release Oil Forecast for the United States. We currently use more oil than natural gas, so this change could in theory lead to a 100% or more increase in natural gas use. Many nuclear plants we now have in service will need to be replaced in the next 20 years. If we substitute natural gas in this area as well, it would further send US natural gas usage up. 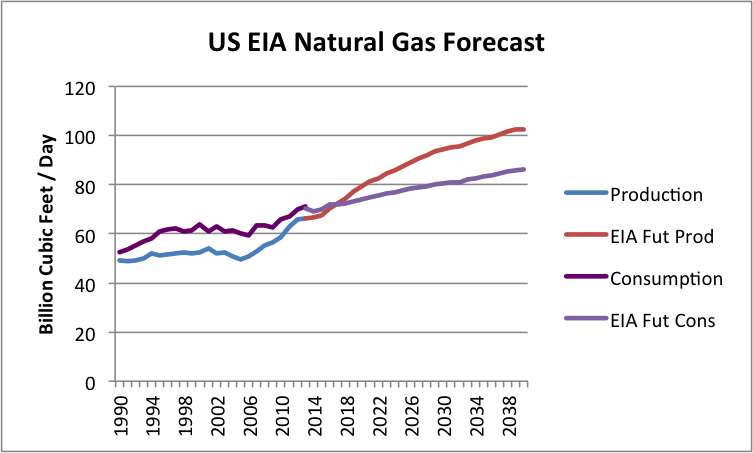 So the EIA’s forecast of US natural gas needs definitely seem on the “light” side. 4. How does natural gas’s production growth fit in with the growth of other US fuels according to the EIA? The answer is (a). Natural gas is the only fuel showing much growth in production between now and 2040. Figure 4 below shows the EIA’s figure from its Annual Energy Outlook 2014 Early Release showing expected production of all types of fuels. Figure 4. 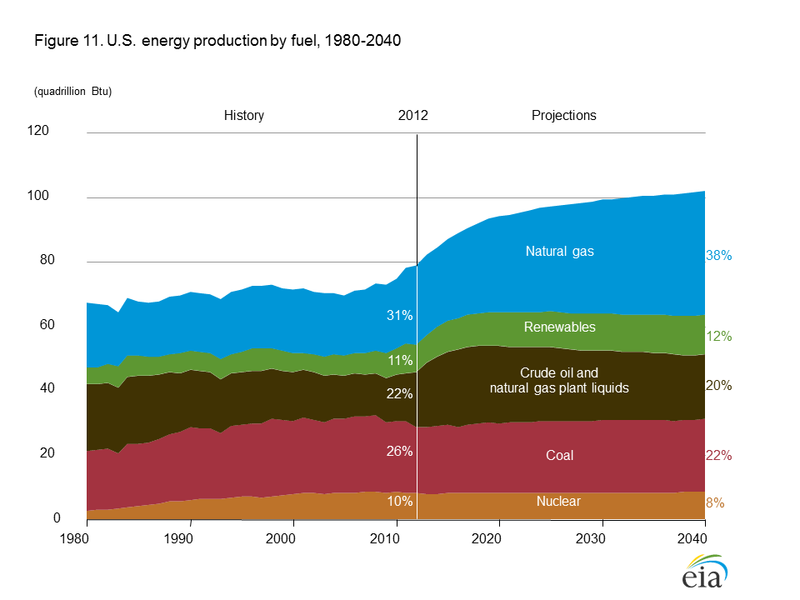 Forecast US Energy Production by source, from US EIA’s Annual Energy Outlook 2014 Early Release. Natural gas is pretty much the only growth area, growing from 31% of total energy production in 2012 to 38% of total US energy production in 2040. Renewables are expected to grow from 11% to 12% of total US energy production (probably because the majority is hydroelectric, and this doesn’t grow much). All of the others fuels, including oil, are expected to shrink as percentages of total energy production between 2012 and 2040. It depends on who you ask: Answer (c). According to the EIA, natural gas prices are expected to remain quite low. The EIA provides a forecast of natural gas prices for electricity producers, from which we can estimate expected wellhead prices (Figure 5). In this forecast, wellhead prices remain below $5.00 until 2028. Electricity companies look at these low price forecasts and assume that they should plan on ramping up electricity production from natural gas. Why all of the natural gas exports, if we don’t have very much natural gas, and the shale gas portion (which is the only portion with much potential for growth) is so unprofitable? The reason for all of the exports is too pump up the prices shale gas producers can get for their gas. This comes partly by engineering higher US prices (by shipping an excessive portion overseas) and partly by trying to take advantage of higher prices in Europe and Japan. There are several catches in all of this. Dumping huge amounts of natural gas on world export markets is likely to sink the selling price of natural gas overseas, just as dumping shale gas on US markets sank US natural gas prices here (and misled some people, by making it look as if shale gas production is cheap). The amount of natural gas export capacity that is in the approval process is huge: 42 billion cubic feet per day. The European Union imports only about 30 billion cubic feet a day from all sources. This amount hasn’t increased since 2005, even though EU natural gas production has dropped. Japan’s imports amounted to 12 billion cubic feet of natural gas a day in 2012; China’s amounted to about 4 billion cubic feet. So in theory, if we try hard enough, there might be a place for the 42 billion cubic feet per day of natural gas to go–but it would take a huge amount of effort. There are other issues involved, as well. The countries that are importing huge amounts of high-priced natural gas are not doing well financially. They aren’t going to be able to afford to import a whole lot more high-priced natural gas. In fact, a big part of the reason that they are not doing well financially is because they are paying so much for imported natural gas (and oil). If the US has to pay these high prices for natural gas (even if we produce it ourselves), we won’t be doing very well financially either. In particular, companies who manufacture goods with electricity from high-priced natural gas will find that the goods they make are not competitive with goods made with cheaper fuels (coal, nuclear, or hydroelectric) in the world marketplace. This is a problem, whether the country produces the high-priced natural gas itself or imports it. So the issue is not an imported fuel problem; it is a high-priced fuel problem. Another issue is that with shale gas, we are the high cost producer. There is a lot of natural gas production around the world, particularly in the Middle East, that is cheaper. If we add our high cost of shale gas to the high cost of shipping LNG long-distance across the Atlantic or Pacific, we will most definitely be the high cost producer. 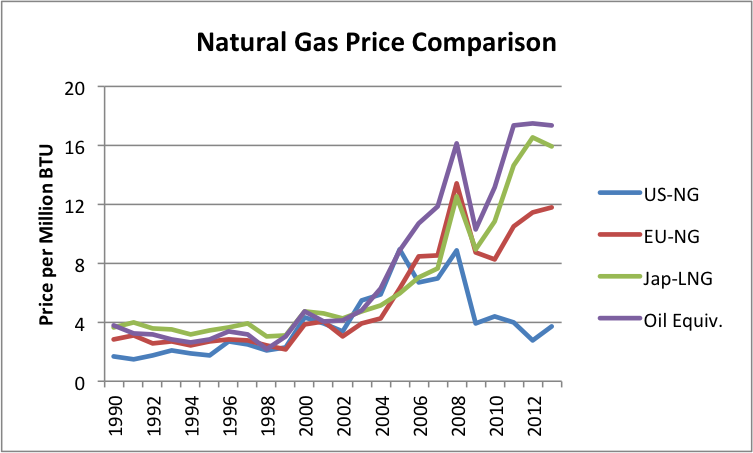 Other producers with lower costs (even local shale gas producers) can undercut our prices. So at best those shipping LNG overseas are likely to make mediocre profits. And there would seem to be great temptation to stir up trouble, to encourage Europe to buy our natural gas exports, rather than Russia’s. Of course, our ability to provide this natural gas is not entirely clear. It makes a good story, with lots of “ifs” involved: “If we can really extract this natural gas. If the price can really go up and stay up. If you can wait long enough.” The story makes the US look more rich and powerful than it really is. We can even pretend to offer help to the Ukraine. Perhaps the best outcome would be if virtually none of this natural gas export capacity ever gets built–approval or no approval. If it is really possible to get the natural gas out, we need it here instead. Or leave it in the ground. This entry was posted in Alternatives to Oil, Financial Implications and tagged natural gas exports, natural gas prices, Ukraine. Bookmark the permalink. Look at the difference between Texas oil production as reported by Texas and as reported by the EIA. In January 2014 the EIA reported 945,541 bpd more than Texas reported ???? ?